This is the 16th of twenty-one lessons for design students, gathered from the combined experience of being a student, and teaching students. I will published one lesson each weekday until they’re done. After years of being around architectural drawings, I have developed a feel for how big things should be when they’re drawn. I imagine this is the case with all architects. When I look at a drawing, the first thing I do is check its scale. This gives me the key to understanding it. I instantly know how big things should be, and often pick up when things are not the right size: a door that’s too narrow or a bench seat that’s too high. Unfortunately, I don’t believe that scale is taught well in architecture schools. Perhaps it dropped off the curriculum at the same time as handwriting and life drawing classes. This is a pity, because knowing your way around architectural scales is an important foundation lesson that’s used a lot in practice. Scale (by which I mean a proportion between two sets of dimensions) is a framework that facilitates visual communication. Just like heavy lineweights mean masonry and dashed lines refer to things that are hidden, scale allows you to show the things you need to show with the right level of detail. You’ll note that I’ve only used scales at multiples of 1, 2 and 5. This is essential. My scale ruler (which I carry with me at all times) happens to only have these standard scales. If you use one that’s not on there, I can’t measure it. I often have students presenting drawings at 1:250 or at bizarre scales like 1:300. These might conveniently allow you to fit your drawing on an A3 piece of paper, but not only do they render my ruler useless, they dismantle all of my intuition. It’s like showing me a piece of prose without all the spaces between words. The letters are all still there, they just don’t make sense anymore. 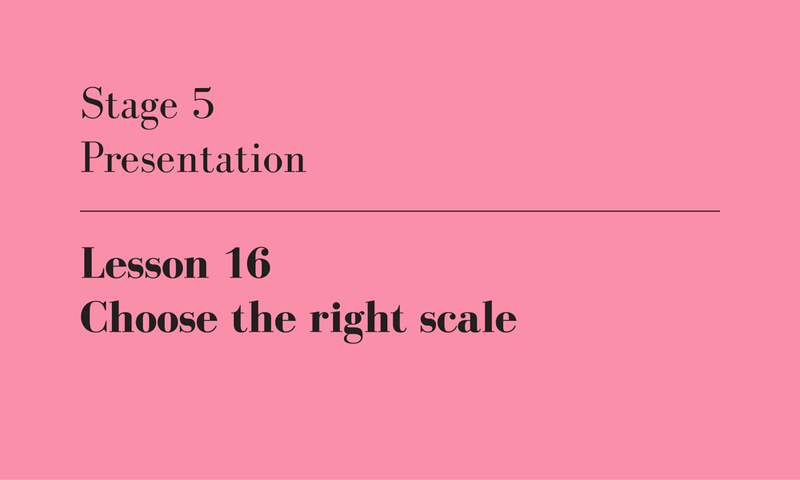 Choose the right scale, author’s own image.